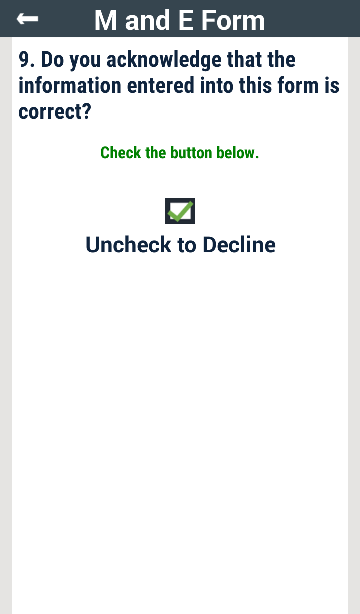 This screen presents a box that a data collector can check or uncheck subject to the textual prompt. A demonstration is given in Example II. A cascade input screen is a special type of single choice option screen which displays a range of options subject to the chosen option of a previous single choice option screen. In the image above, the screen on the right is the Cascade screen input type. 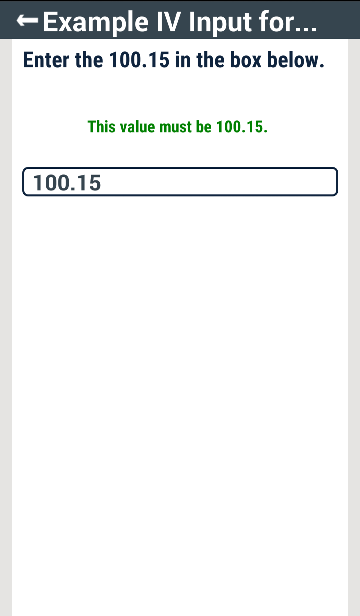 The options displayed on the screen on the right is dependent on the value selected on the screen on the left. See Example I for a demonstration. 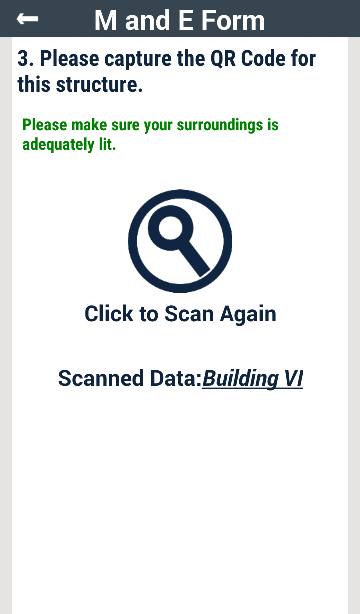 The scan code input screen is demonstrated in Example II. 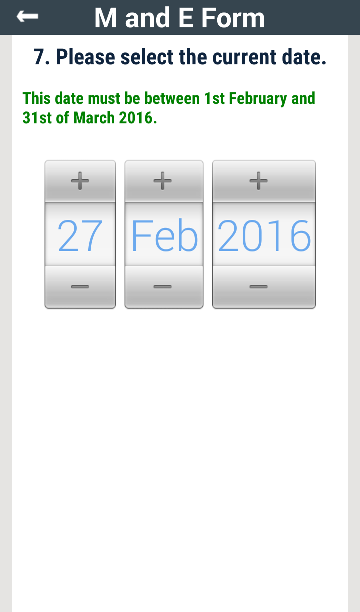 A date input screen is as presented in the image above. 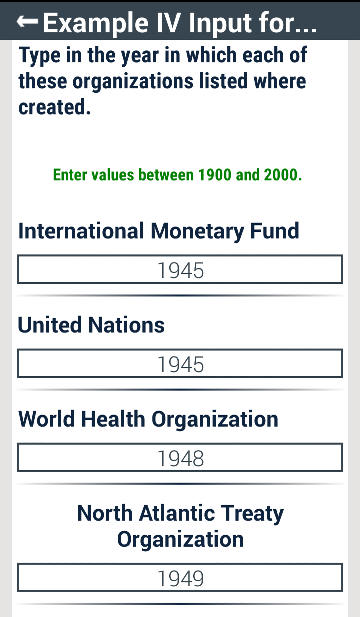 This screen can be defined such that the allowable date inputs are restricted to a date range or limited to dates that are not less than the present day. A parameter can also be set that ensures that dates collected are converted to their Coordinated Universal Time (UTC) equivalent before being stored. See Example II for a demonstration. An Information output screen is used to present a text to the data collector e.g., instructions. This screen is the only output screen available. An instance of this screen type is presented in Example II. The screen shown in the image above is an example of an integer input screen. This screen will only accept integers as inputs. Its input can be restricted to a range of integer values or multiples of an integer value. An instance of this screen type is presented in Examples I, II and III. An integer input list screen allows for the collection of multiple integer values. Its allowable inputs can be restricted to a range of integers or multiple of an integer just like the Integer input screen. An instance of this screen type is presented in Example IV. This screen allows for the capture of the current physical GPS location of the device. 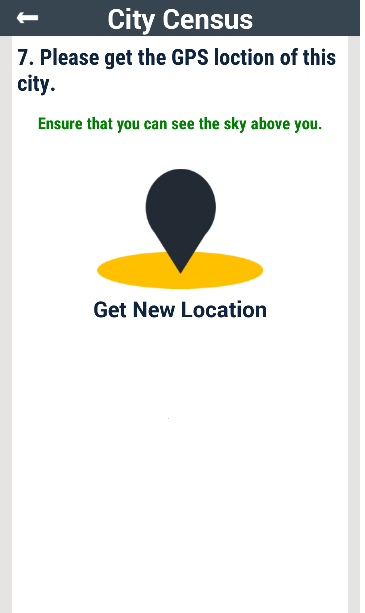 During definition of the location screen, the accuracy required in meters for the GPS reading can be specified. An instance of this screen type is presented in Example I. 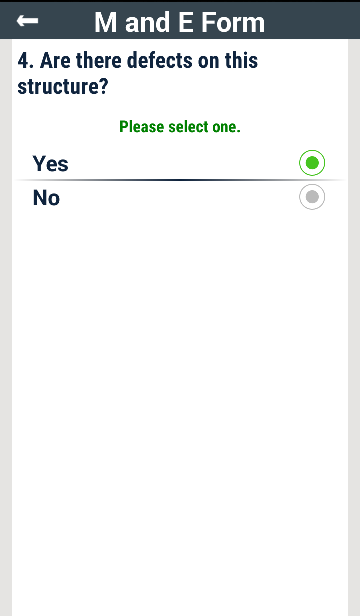 The screen shown in the image allows one to select one or more options from the choice options available. An instance of this screen type is presented in Example I. 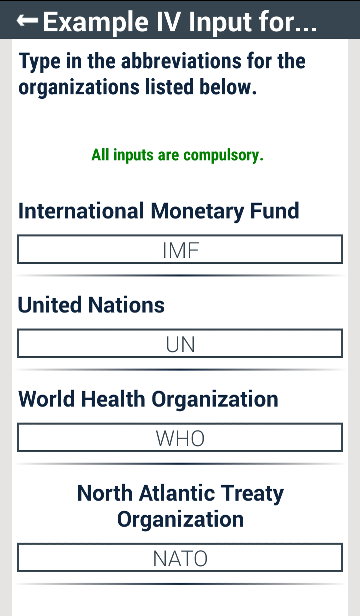 The multiple choice list screen allows one to check a number of choices for one or more option labels. An instance of this screen type is presented in Example IV. The screen shown in the image above is an example of a numeric input screen. 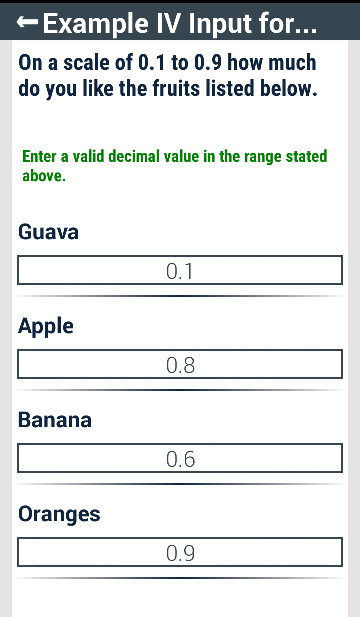 This screen will only accept numbers i.e., integer or decimal numbers. 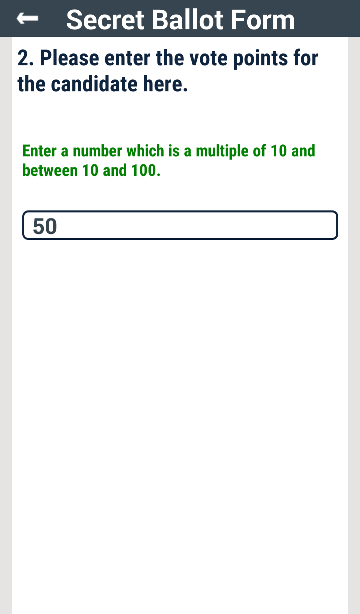 Its input can be restricted to a range of numeric values or multiples of a numeric. An instance of this screen type is presented in Examples IV. A numeric input list screen allows for the collection of one or more numeric values. Its allowable inputs can be restricted to a range of numbers or the multiple of a number. An instance of this screen type is presented in Example IV. A photo capture screen allows one to take a photo using the device’s camera or add a photo from the device storage. 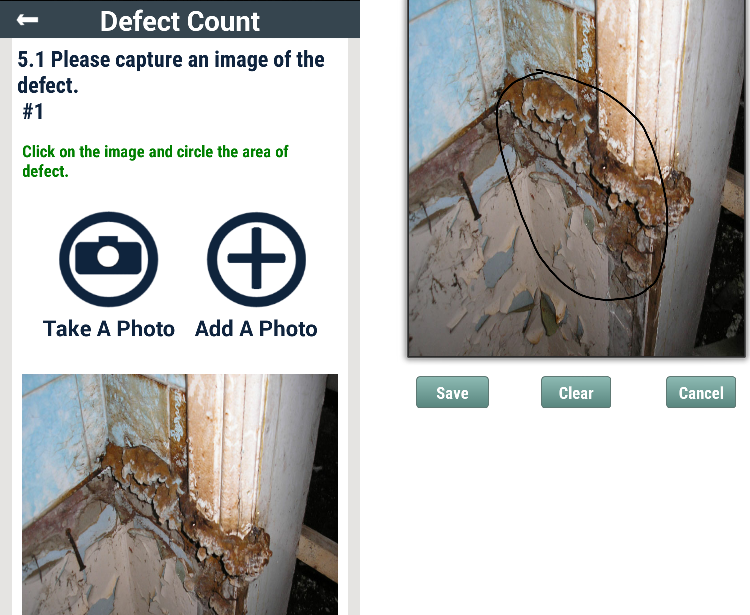 If during the screen definition the “Enable image annotation” box is checked, then the data collector can click on the image, annotate the image and save the annotated image as shown in the image above. An instance of this screen type is presented in Example II. A repeat screen is one which replays one or more input screens a number of times. 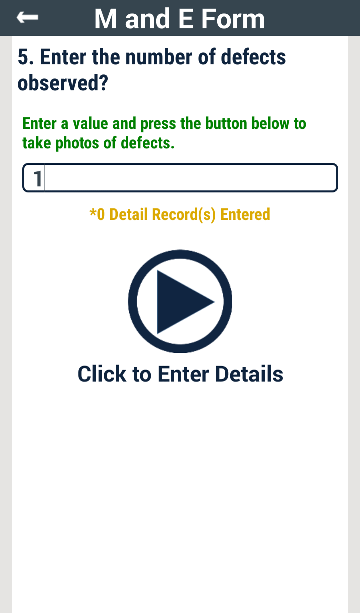 The number of replays can be set during the screen definition or entered by the data collector. See Example II for a demonstration of this screen type. 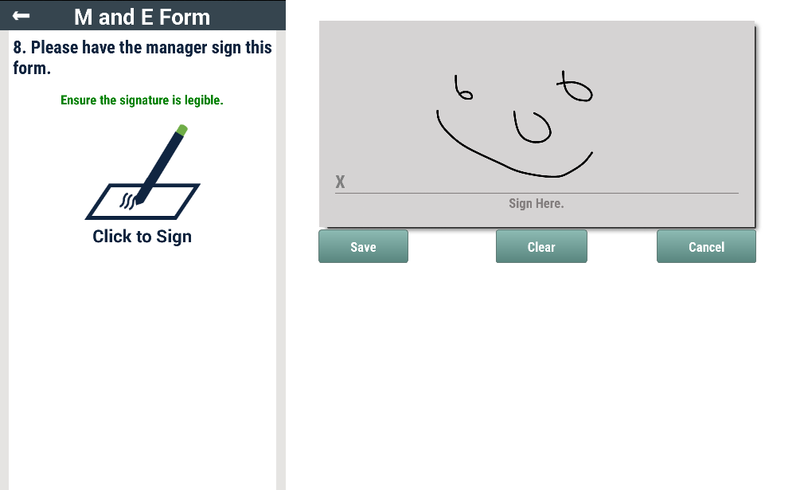 The signature input screen is self-explanatory. An instance is presented in Example II. 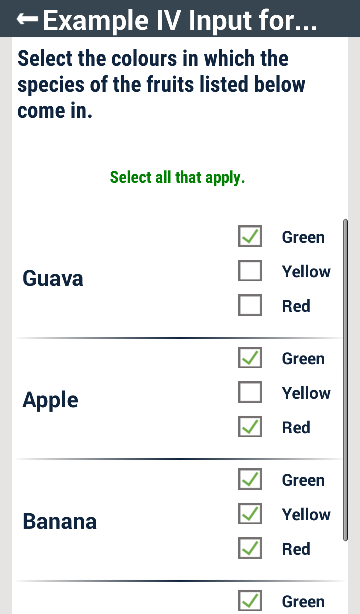 The single choice input screen allows one to select one option only from a number of options as shown above. An instance of this screen type is present in Examples Iand II. 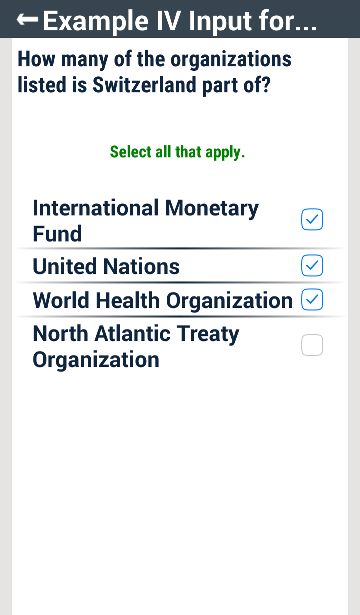 The single choice list screen allows one to select one option for one or more option labels. An instance of this screen type is presented in Example IV. The text input screen accepts any alphanumeric character or string of characters. The string of characters entered can be restricted to a certain minimum or maximum length or both. Further restrictions can be placed on the input using regular expressions (RegEx). See Examples I and II for the basic text input screens and Example III for a text input screen with the RegEx parameter set. A text input list screen presents a screen with one or more text boxes in which a number of alphanumeric strings can be entered. As with the text input screen, the inputs for this screen can be restricted by length or regular expression (RegEx). A time input screen is as presented in the image above. This screen can be defined such that the allowable time inputs are restricted to a time range. A parameter can also be set that ensures that time values collected are converted to their Coordinated Universal Time (UTC) equivalent before being stored. See Example II for a demonstration. The metadata component is not a screen as such; it collects data associated with the form and the device in the background. 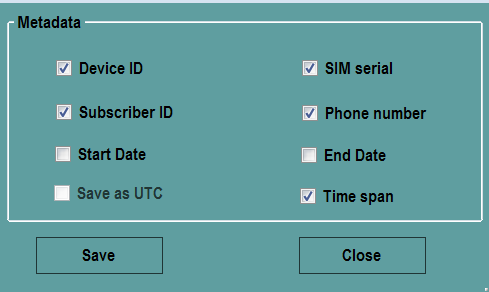 The following metadata component can be collected; “Device ID”, “SIM Serial”, “Subscriber ID”, “Phone number”, “Start Date”, “End Date” and “Time Span”. The “Start Date” is the date on which the filling of a form began. 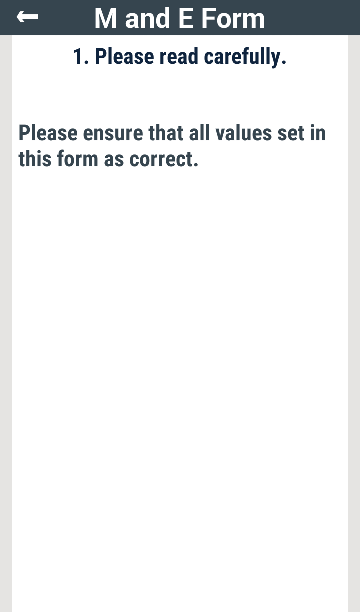 The “End Date” is the date on which the form is completed. The Time Span is the time duration, in days, hours, and minutes and seconds, it takes a form to be completed. If the “Save as UTC” box is checked, the Start and End dates will be saved in their UTC equivalents. The “Subscriber ID” and the “Phone Number” components are stored in the SIM card of the device. Sometimes, the SIM card provider prevents access to this information. In such instances the value of these two components will be set to “N/A”. See Examples II and III for metadata definition and collection.